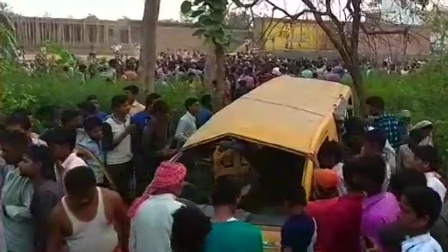 GORAKHPUR/NEW DELHI: Thirteen school children were killed and six others seriously injured on Thursday when a train hit their van at an unmanned railway crossing in Uttar Pradesh’s Kushinagar, police said. Chief Medical Officer (CMO) of Kushinagar district, Akhilesh Kumar told that one child and the driver of the van were in critical condition. Railways spokesperson Ved Prakash said that the children died on the spot as the Siwan-Gorakhpur passenger train crashed into the van at the crossing, 100 km from Gorakhpur. Chief Minister Yogi Adityanath’s office instructed district authorities to undertake rescue and relief operations immediately. “I am saddened by the news of school children dying in a train accident. I have spoken to senior railway officials and ordered an inquiry into it,” Goyal said in a tweet.